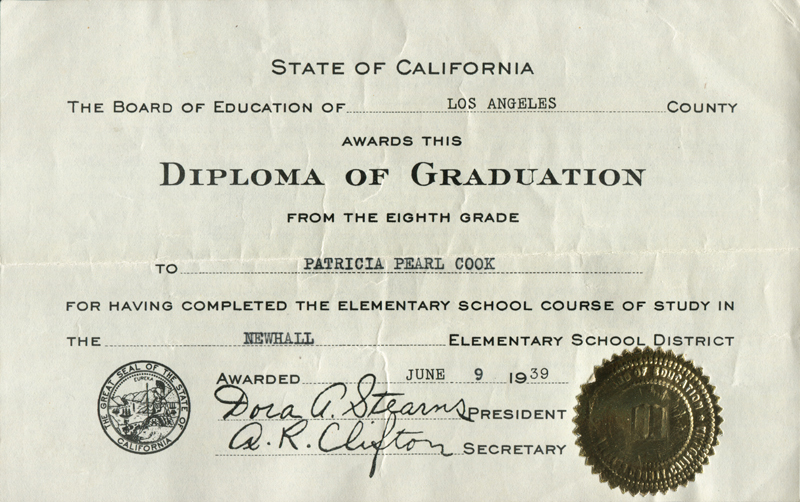 Patricia Pearl Cook's diploma from the K-8 Newhall School, awarded by the Los Angeles County Board of Education in June 1939. Four months earlier the school burned to the ground, and subsequent classes were held elsewhere in the community. Silver-bronze colored seal. Incomplete impression but should read, "Board of Education / Los Angeles County, California." This diploma of graduation from the eighth grade should be considered not as a document evidencing the completion of a period of education, nor as an award granted for personal accomplishment, but rather as a symbol of experience. You have been participating for a period of approximately eight years in a program of activities intended for the purpose of assisting in the development of your personal abilities, interests and capacities. The extent to which sharing in those activities has contributed to your advancement in such ways as to make you a better and more active member of society is the standard by which you can measure your success. In your planning for the future it is well to remember that human beings are not static. Each person continues to grow, develop, change, and learn so long as he lives. Personal improvement and adjustment to changing conditions require a continuation of purposeful education throughout life. Universal free education provided by the state at public expense in elementary schools, in secondary schools and in higher educational institutions affords ample opportunity for continued directed learning activity on all levels. Everyone should continue to take advantage of these educational opportunities to the full extent of his interest and ability. We believe that the guidance which you have received thus far will stimulate you to strive for great self-control, self-mastery and self-direction. If this belief is justified we know that the schools shall have served their purpose by assisting you to become a good citizen. PC3901a: 19200 dpi jpeg from original diploma donated 2003 by Patricia Bennett (nee Patricia Pearl Cook) of Carpinteria.